Here’s where it gets tricky. Mike is a Cyclone. Early on we both agreed we would watch both teams. So after watching the Cyclones faithfully, through thick and thin (just like with my Hawkeyes), over the past 10 years I’ve gradually become a Cyclone fan. I’ve come to know their team and their coaches well and enjoy following them in both football and basketball. However, when they play my Hawkeyes I still root for Black and Gold. Unfortunately, I can’t say the same for Mike. He watches the Hawkeyes but has a hard time getting excited about their success. Like he told me on Sunday after Iowa upset #3 Ohio State, “I have one team…the Cyclones. The Hawkeyes would be my second favorite team if I had more than one team…but I don’t.” Yes, it can be frustrating sometimes, but as long as my Hawkeyes do well, I don’t care who is cheering for them 🙂 The fact that both our teams are in the top 25 this year is beyond thrilling in our house. After watching them during their worst years in the early 2000’s (we are far from fair weather fans), the fact that they both are finally doing so well is something we’ve waited to happen for almost a decade. As we prepare our weekly schedule for each game, we also plan our “Game Time Menu.” For me, being the foodie that I am, this is almost as exciting as the game. 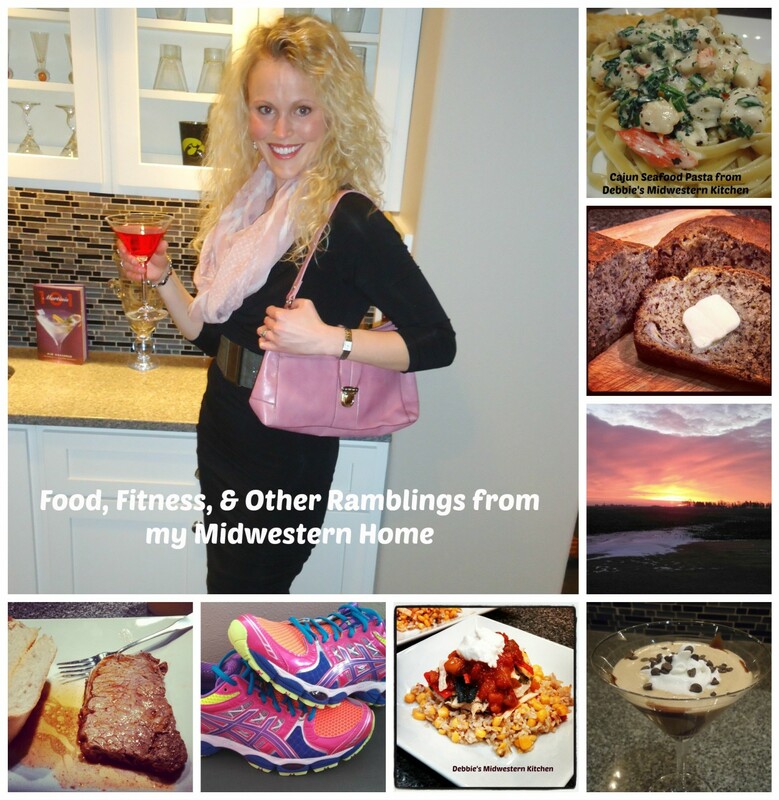 My favorite game time meals usually involve appetizers and finger food. 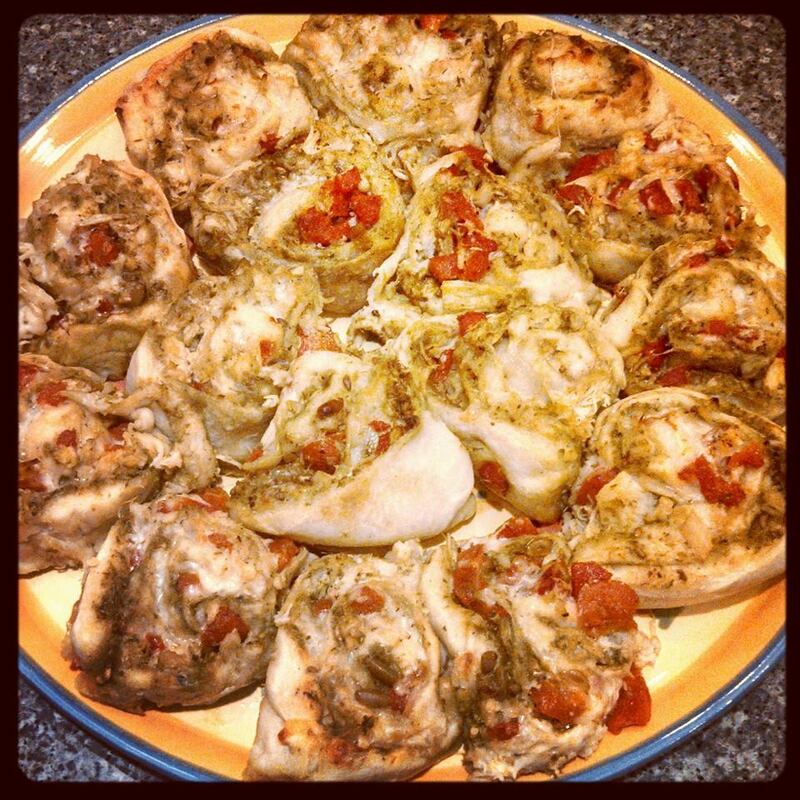 Here is a recipe we tried a few months ago that was a huge hit and one I’ve made several times since – Chicken Pesto Roll-ups. I usually make these with Basil Pesto, but the last time I went to the grocery store they were all out so I substituted Sun-Dried Tomato Basil instead, and it was just as good! Unroll pizza dough and spread pesto to edges of dough. 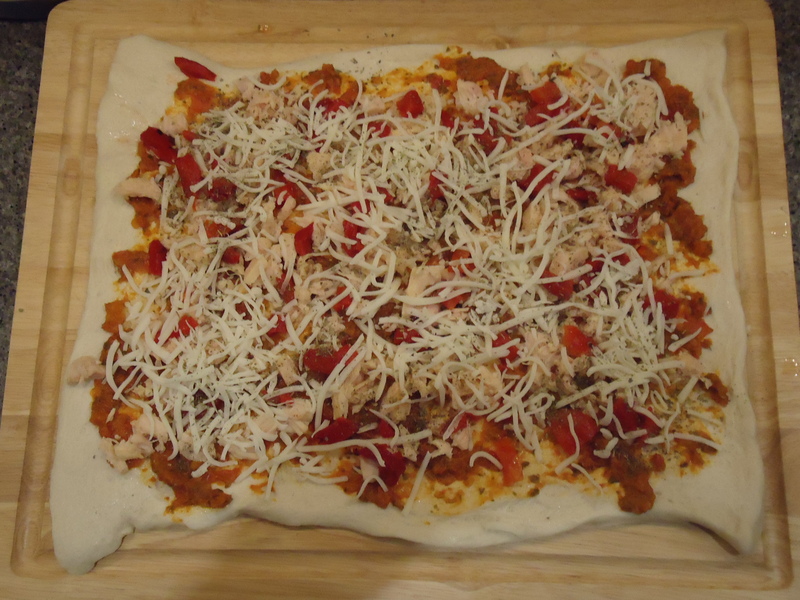 Evenly distribute chicken, roasted peppers, and cheese. Sprinkle Italian Seasoning overtop. Then, starting with the short side (if you’re looking at the picture above you would start on the left or right side of the picture) carefully roll the pizza crust back up so it looks like the picture below. Spray a 9-inch round baking pan with cooking spray. Here comes the tricky part. Take a serrated knife and cute the roll into eight separate piece. 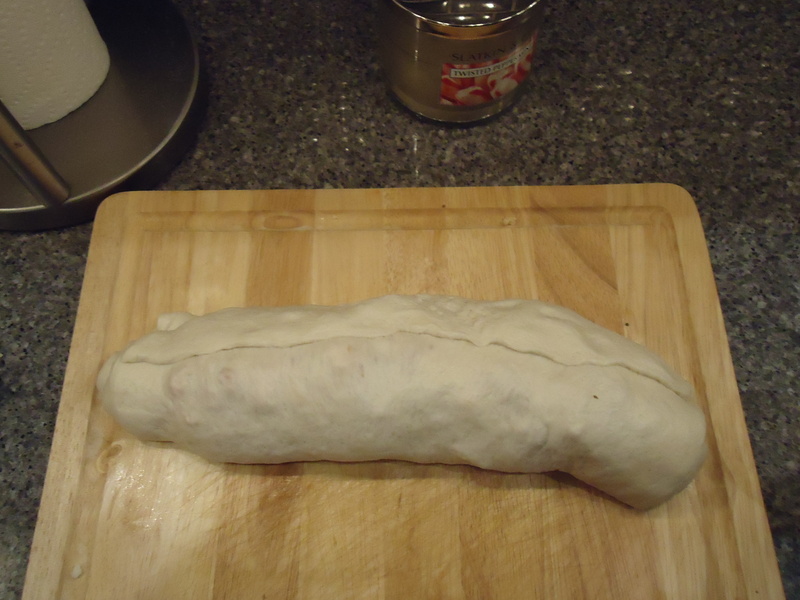 This part can get a little messy so you have to be extra careful so the filling does not fall out of the crust. The easiest way for me to do it is to cut one piece and then carefully place it in the baking pan, then cut another one, etc. All eight should fit into the baking pan just right. Bake for 20 minutes until tops of roll-ups are a golden brown. Cool 5 minutes before serving. These roll-ups have been a hit every time and only take about 15 minutes to put together. 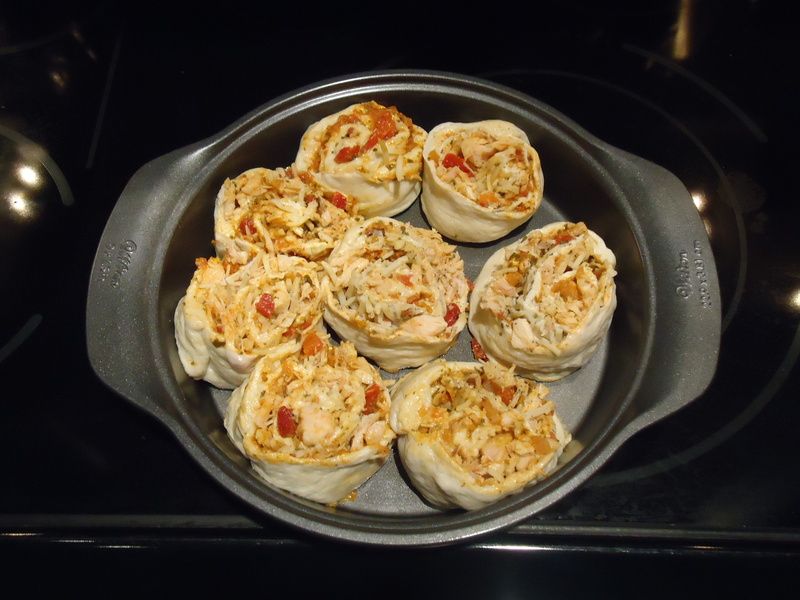 Give them a try for your next tailgate or for an easy meal you and the kids will both enjoy. Those look so good and easy and that is key, isn’t it? We are college basketball fans here in our house and we go for the ACC—UNC in particular although we also cheer the Wolfpack of NCState along too. I think college ball is so much better than pro ball, don’t you??? One of these days maybe we will convert to being Hawkeye or Cyclone fans…. I agree…we never watch Pro bball. I’m all about college bball and football. You should definitely consider becoming Hawkeye and/or Cyclone fans!